I wondered if I should even do one of these since I've only been blogging on this since November, but why not? And, this will be my last post for 2010. I was hoping to get up the toffee I made last night, but don't think that will happen and I'm busy from here till next week. So ... Happy New Year, everyone! I hope you have a safe New Year's Eve and a blessed New Year and share your blessings with others! I have so many that I made for Christmas that I haven't had a chance to put up yet! Oh well, I'll be ahead for next season! Since I don't post something on the blog unless it's good, it's hard to pick 10, but I'm sure this is much easier for me than it is for those of you who have blogged all year! :-O What I have to look forward to next year! We have a lot of leftover turkey from Christmas. I froze some of it immediately for a future gumbo and froze some more for eating however we want. But we still had some in the refrigerator and I wanted to do something about it last night. I love turkey sandwiches probably more than the next person, but I wanted something different. 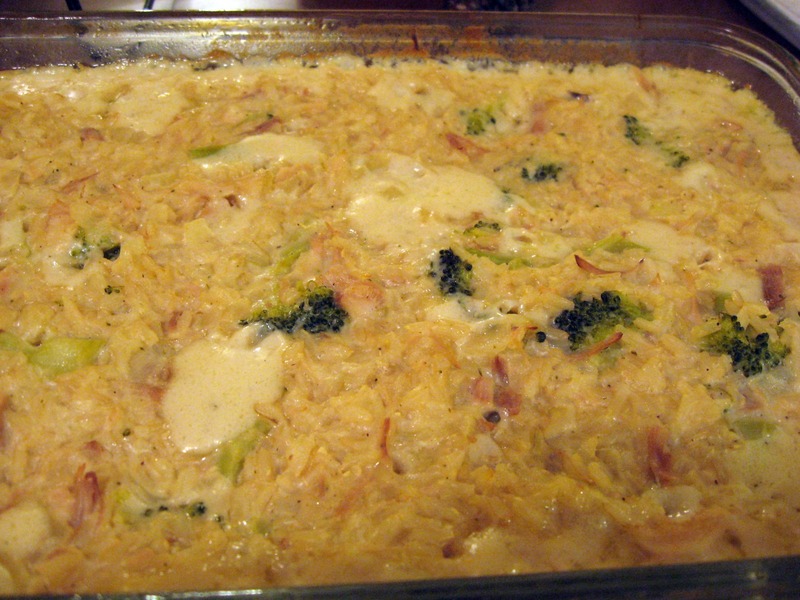 Something that was like comfort food. I also had some leftover chicken stock from the dressing and wanted to use it up if I could. 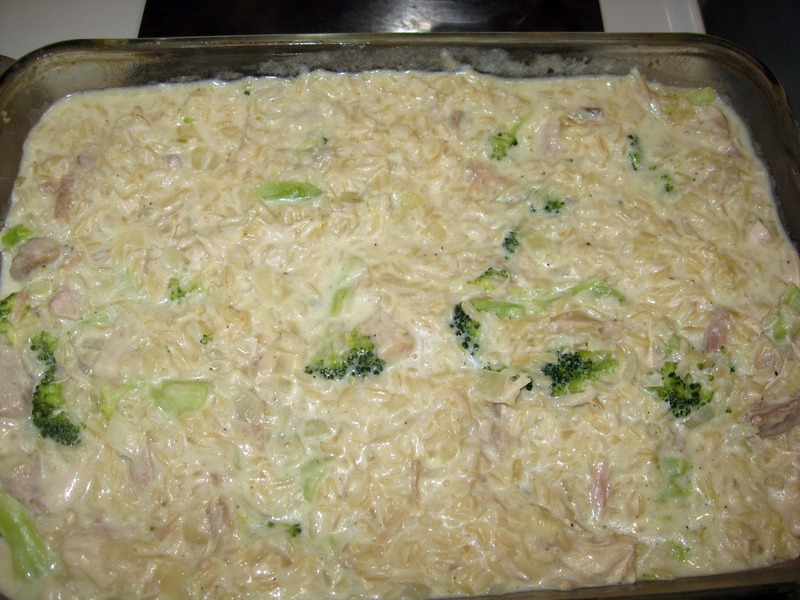 I looked around at some recipes and specifically glanced over these two: http://southernfood.about.com/od/turkeycasserole/r/bl50804c.htm and http://allrecipes.com//Recipe/turkey-tetrazzini-ii/Detail.aspx. Then I did my own thing and, like I always do when I make one of my "experiments," told the family I didn't know if it would be any good. My husband, amazing man that he is, always tells me he loves my experiments. He can only think of one thing that I made that wasn't great, he says, and he doesn't remember what it was. A problem with my experiments is I often don't write any of it down as I'm throwing things into the pans, so I often can't recreate them. Now that I'm blogging, however, I'm getting better at it. Last night I wrote everything down, so I can recreate it -- and I will want to. 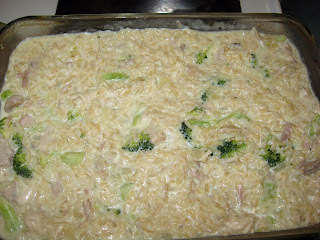 This made the house smell amazing as it was cooking and baking and none of us were disappointed in the taste. I'm sure I've had something that tasted similar to this in the past, but I'm also sure it was full of canned soup and processed pleasures. You won't find that in this. 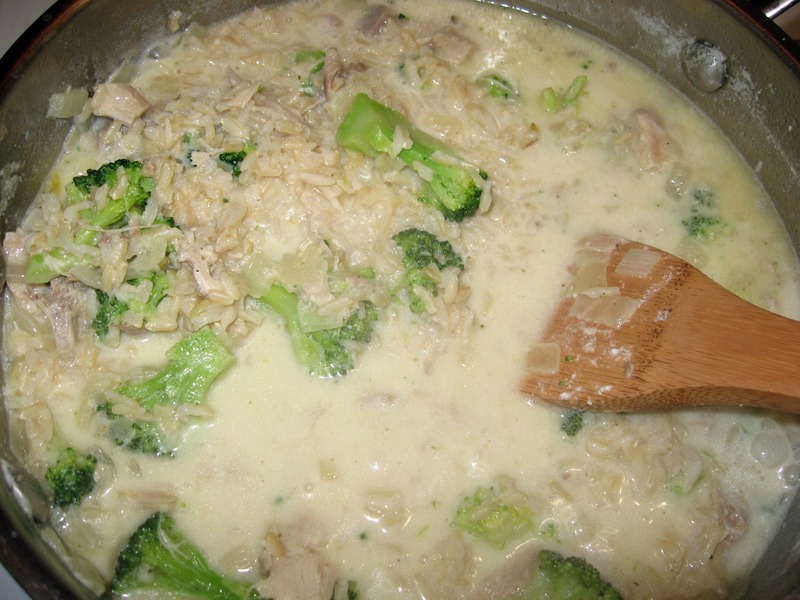 You'll be using brown rice, so make sure you give yourself an hour to cook it while you prepare the other ingredients. Projected prep time (not including rice cook time): 45 min. Projected bake time: 25 min. Preheat oven to 350 degrees. 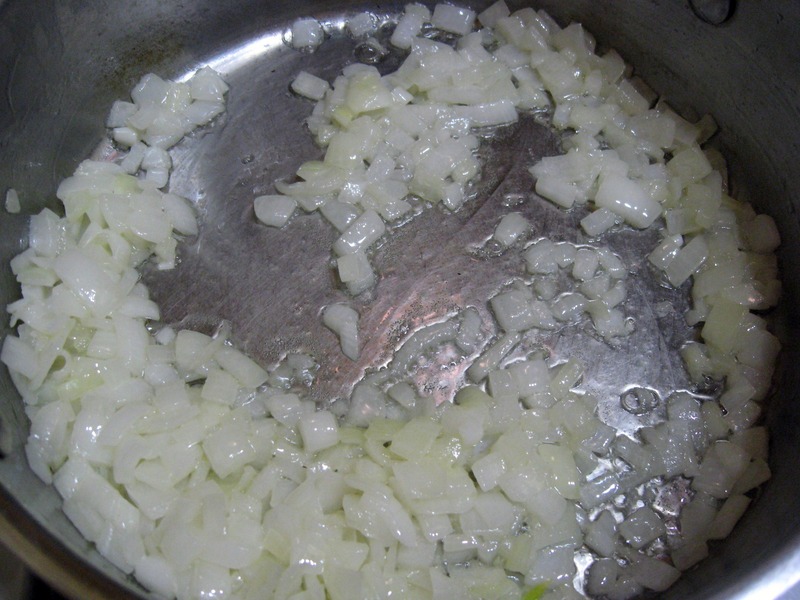 Melt your butter in a large pan and add diced onions. Simmer until they are wilted and almost clear. Add freshly pressed garlic cloves, mix in with onions and simmer two or three more minutes. Add chicken stock, bring to simmer and let cook for a few more minutes. 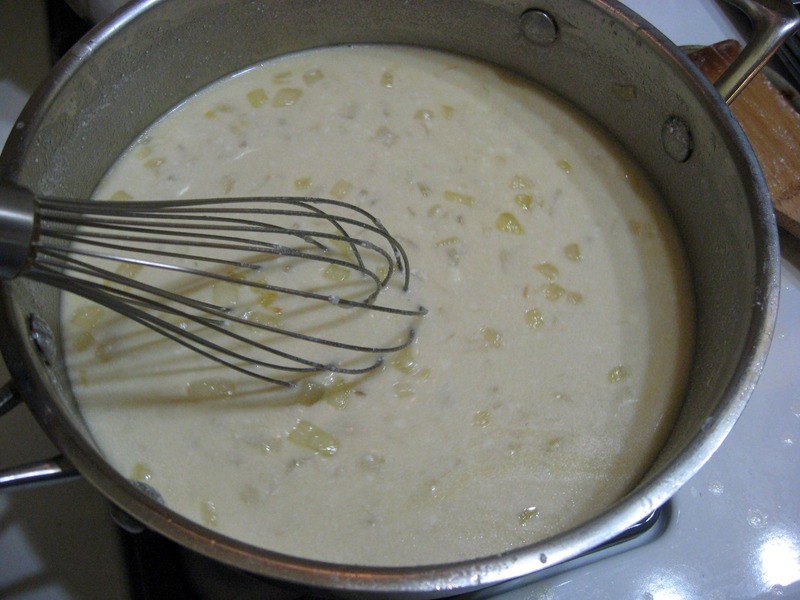 Whisk in your sour cream and continue to simmer a few more minutes. Add a little salt and pepper, then add your turkey. Heat through. Add cooked broccoli florets, heat through. Add cooked brown rice, simmer. 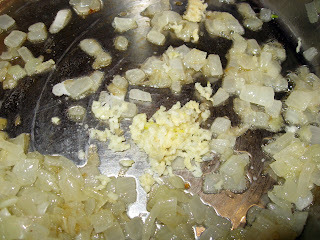 Add more salt and pepper to taste, and dash of cayenne pepper. Heat through. 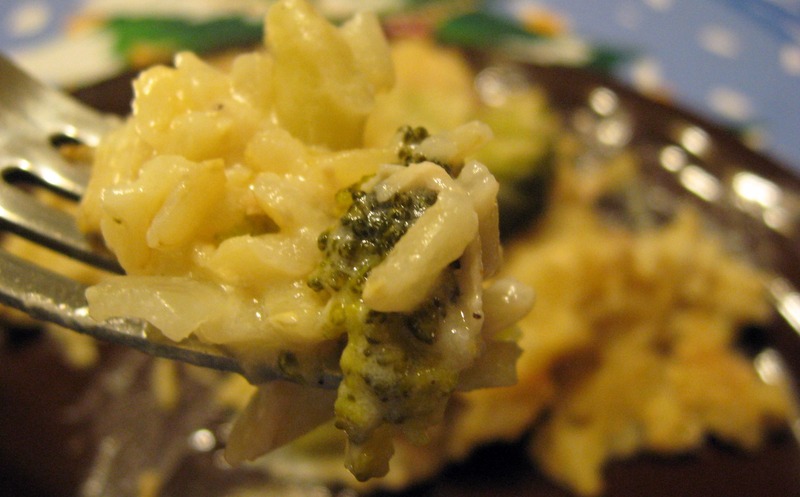 Pour into a well-buttered baking dish. I used my 11.5x8.5 pan for this one because I thought my 13x9 might make it too thin. Turns out the size I used was just right. Flax seed. Salba seed. Quinoa. Amaranth. Coconut flour. Sorghum. Millet. Rice bran. Brown rice. Almond meal, and more. 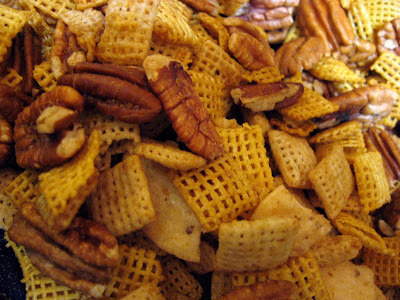 That's a big fiber punch, and you'll find it all in these yummies. My mom used to make Morning Muffins from the Uncle Sam cereal. I loved them, and wanted to try to mimic them GF. Using that recipe, I changed nearly everything and came up with this one. This was my first try, and I'll probably make some changes if I make them again. 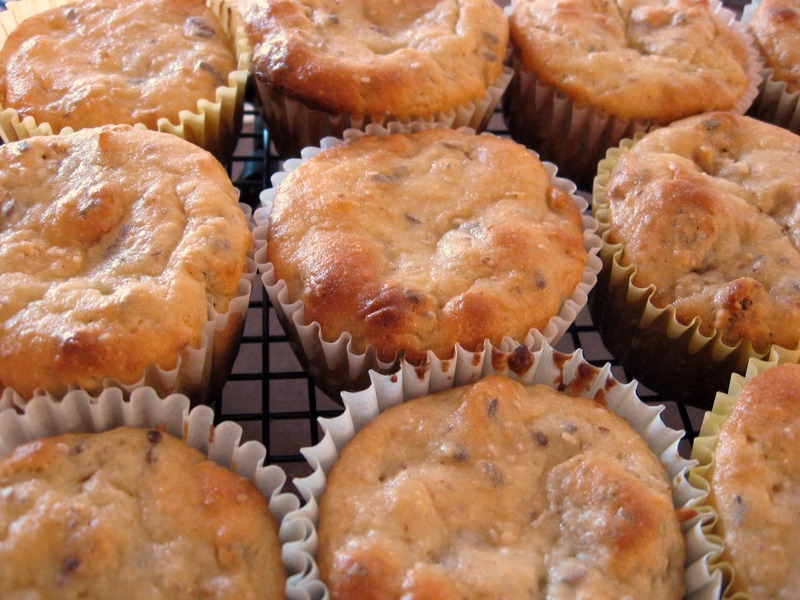 I'm going to go ahead and share the recipe with you, though, because they were pretty darn tasty and the kids loved them -- eating a total of three each for breakfast and declaring they were some of the best muffins they'd ever eaten. My husband also told me just now that he didn't think there was anything at all wrong with them, taste or texture. "They're GREAT!" he said. They certainly aren't dry muffins, which I guess is a good thing considering how fiber muffins sometimes can be, but be sure to drink plenty of water or another liquid with them. I'll go ahead and tell you what changes I plan to make in the future, in case you want to go ahead and make them with these changes. I wasn't crazy about the crumb. It was a little too moist, kind of gummy. It reminded me exactly of the English popovers I made before going GF. I loved them and they tasted great, but it's not necessarily what you expect when you bite into a muffin. It wasn't enough for me to say don't try the recipe, though, because the texture wasn't gross -- I just want to work on it. I'd like for them to be a little less dense and rise a little more. 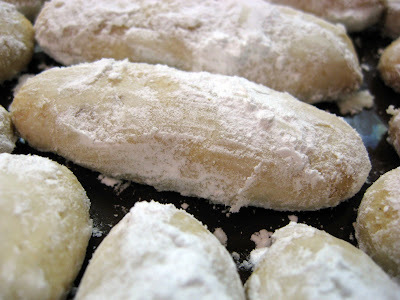 I may experiment a little more with the flour blends I used and omit something and/or change measurements. I'll be using 1/4 cup less sugar next time. 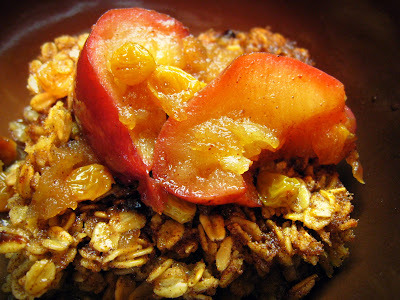 The cereal used in this recipe is sweeter than the Uncle Sam cereal, therefore I should have used a little less sugar. I was distracted when I was measuring and pouring the buttermilk. 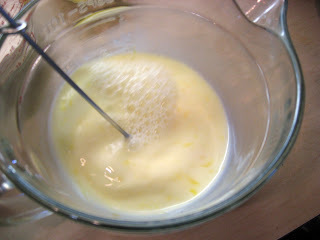 I honestly can't tell you whether I used 1 3/4 cups of buttermilk or 2 1/2 cups. If I used 2 1/2 cups, that may explain the crumb and may solve the problem mentioned above. 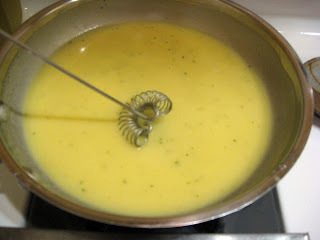 Still, the batter was thick and didn't seem like I'd put too much in it once it was all mixed. The amount of fiber really soaks up moisture. I'll be starting out with 1 3/4 cups in the future and adding up to 2 1/2 cups, total, if it seems too dry. 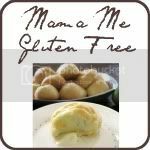 I used canola oil because I wasn't sure with the coconut flour if using extra virgin coconut oil would give too much coconut flavor. Next time I'll be trying it with organic extra virgin coconut oil. Preheat oven to 375 degrees and line muffin tins with baking cups or butter the tins very well. In large mixing bowl, combine cereal, seeds, flours, baking powder and sugar. I did this the night before and covered it, having it ready to add wet ingredients in the morning. 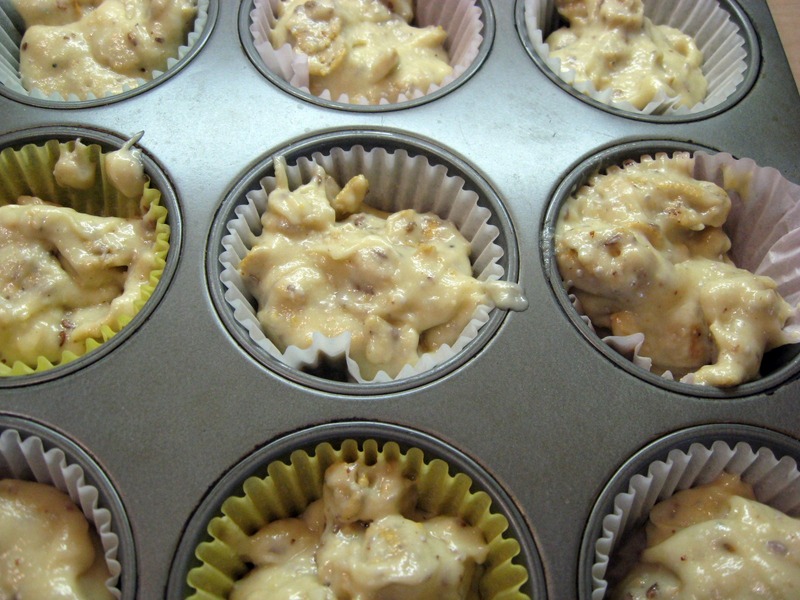 Fill muffin tins about 2/3 to 3/4 full. Bake for approximately 22 to 30 minutes, depending on oven. Muffins are done when browned on top and bounce back when pressed on. 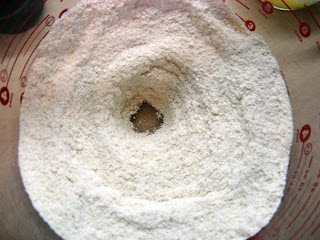 Insert toothpick in center to make sure no wet batter remains. The crumb is moist as this recipe is, so you may have moist crumb on the toothpick but it shouldn't be wet batter. 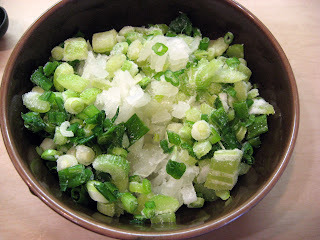 If I revise this recipe in the future, I'll add the edits into this post. Enjoy! In my family, we like our turkey at both Thanksgiving and Christmas. Sometimes we'll freeze some turkey from Thanksgiving for Christmas, sometimes we'll prepare another one. This year I prepared two. Our Christmas turkey was one that had been in the deep freezer for almost a year because I was afraid to fix it. It was right out of the Christmas Carol -- Tiny Tim's turkey. A whopping 26 pounds. I'm used to fixing 18-20 pound turkeys, sometimes smaller ones. This one wasn't going to fit in a roasting bag, let alone my roasting pan. I had been bummed last year that I waited a week before Thanksgiving to get our turkey and had to settle for an 11-pounder. So I bought the biggest one I could find later, only to bring it home and realize how very big it was. Daunting. I then went out and bought a smaller one that I could fix with confidence. But ... this year I fixed it. I cut a lot of the fat off it, then we removed one of the thighs and drumsticks so it could fit in the roasting pan and bag. It took nearly 4 hours to cook -- and the thigh/drumstick took more than an hour! It certainly wasn't the prettiest turkey, after being mutilated like that, but it was delicious, and it will make some good gumbo. I'll share that recipe with you when I make it. This post isn't about my huge turkey, however, it's about the dressing. Stuffing, as I also sometimes call it. You can't have a turkey without it, right? 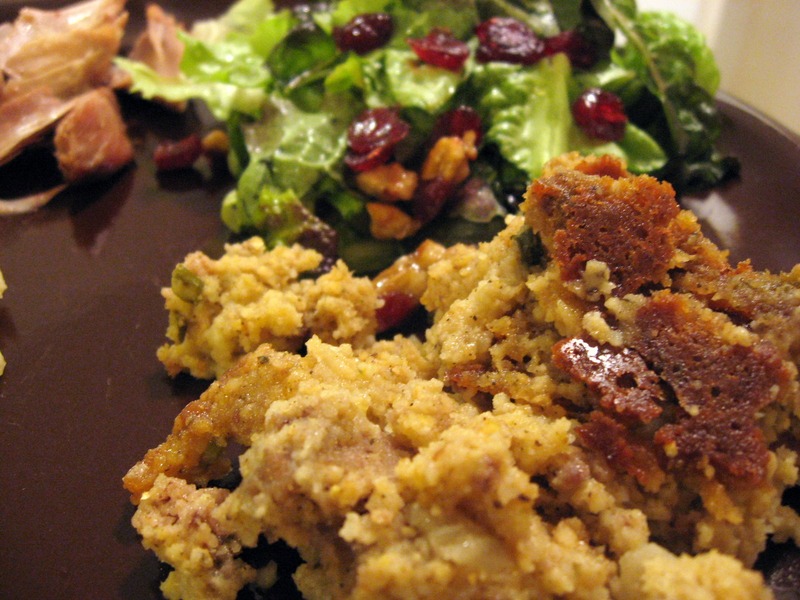 I realize it's a little late to be providing such a recipe but it's fresh on my mind right now, and this way you'll be sure to have it for next year's Thanksgiving. 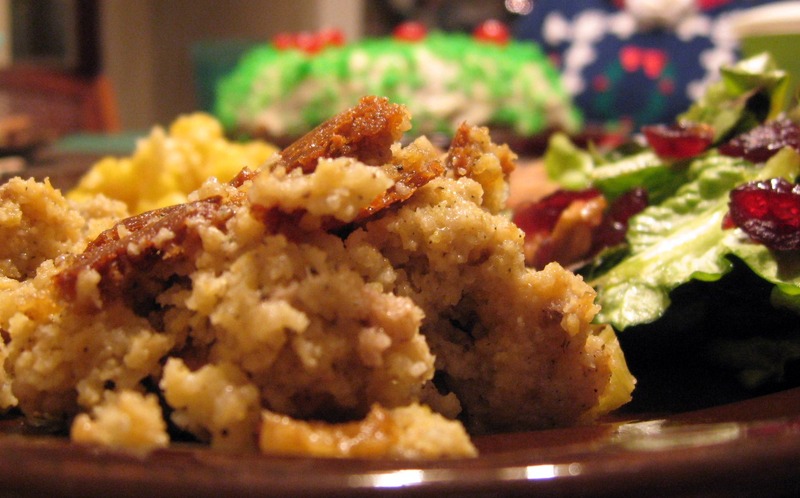 There is a corn bread dressing recipe that has been used in my family for generations. It's amazing. But it's not the one I make. After I had children, I wanted something simpler. 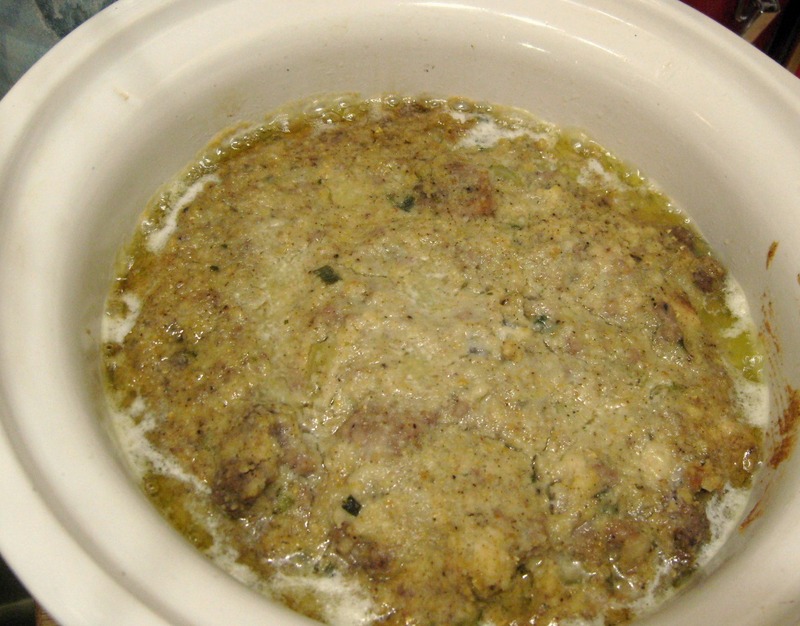 I'd heard rumors of a delicious crockpot recipe, but could it compare to my family recipe? The only way to know was to try, and try I did. And it was. After going gluten-free, I wasn't sure but gave it a try with some different ingredients. 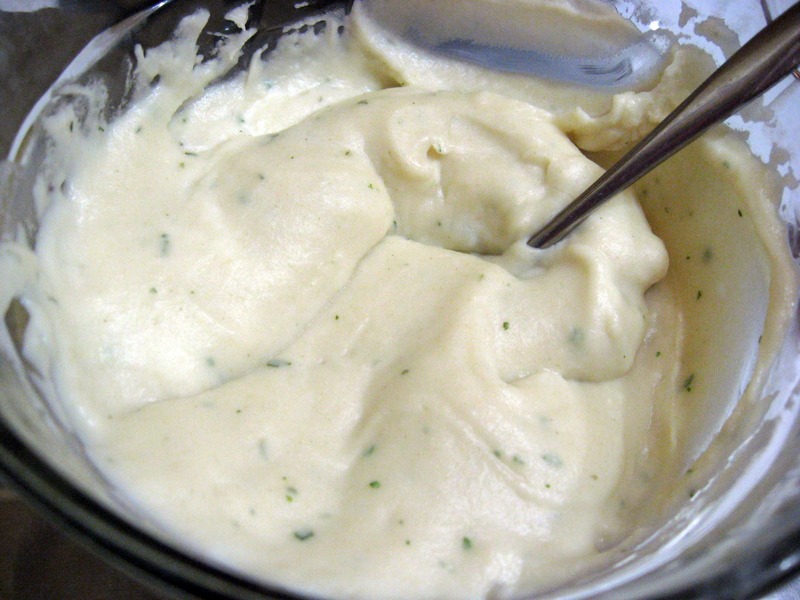 If anything, this dressing is better than the one I grew up with. It certainly tastes very similar, and my mouth waters just thinking of it waiting in the refrigerator right now. 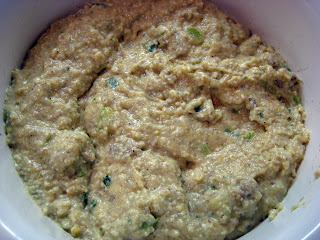 I adapted this recipe from http://www.food.com/recipe/crock-pot-cornbread-dressing-146944. Note: Setting the bread out 2 days before will save time later - and so will making your gravies ahead of time! 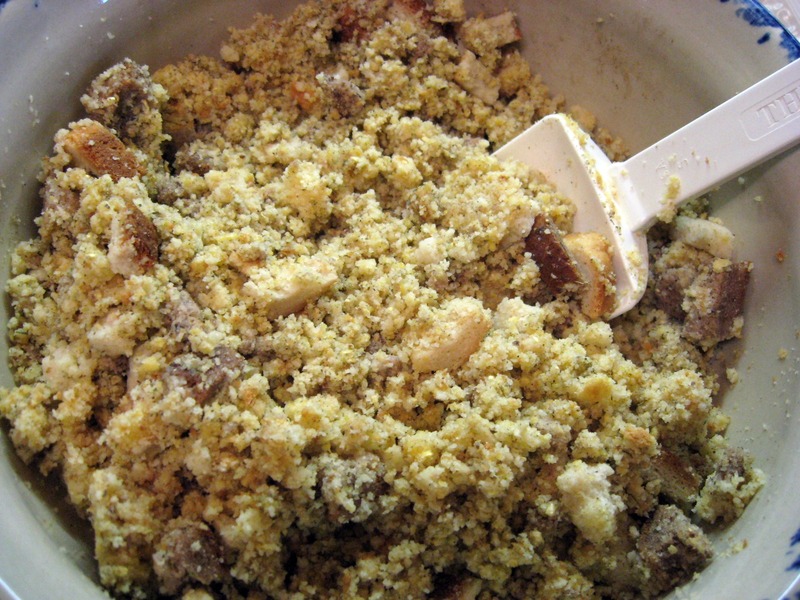 Crumble the corn bread and add to the bread, mixing all up and spreading onto a large cookie sheet. 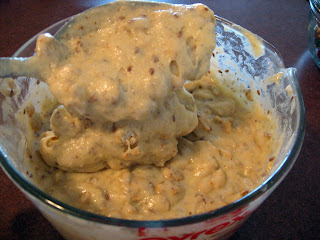 Let it sit out like this to dry for two days, mixing through it every so often so it dries evenly. 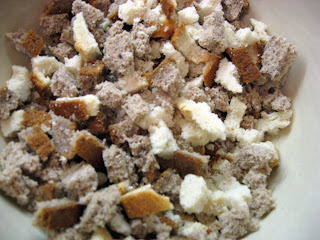 The gluten-free bread is denser, so it needs longer to dry and cook. Chop up your veggies and have them ready any time. In this photo, they are actually thawed from the freezer because enough was chopped up at Thanksgiving. 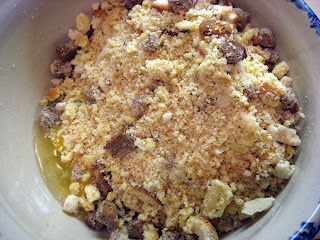 Break your eggs into a very large bowl and add your bread crumbs, black pepper, poultry seasoning and a little salt. In my case I usually take two or three good sized pinches from my salt cellar. 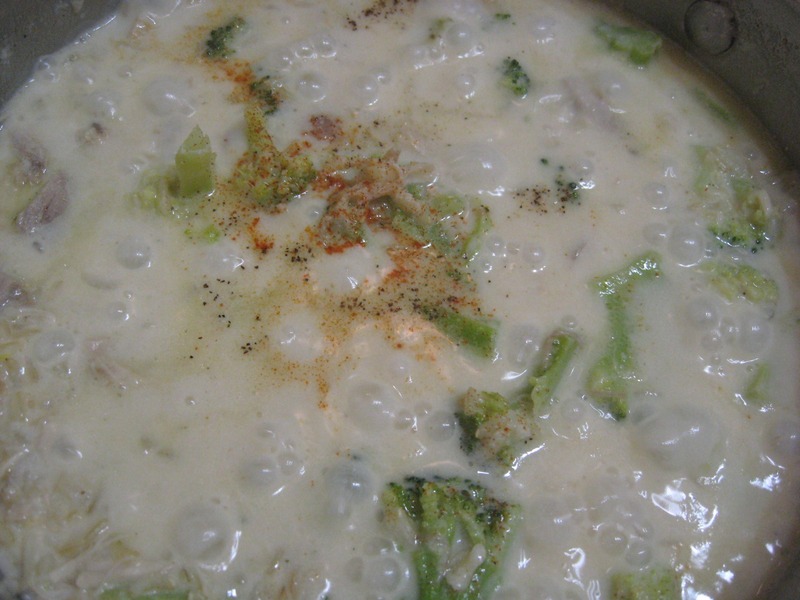 Add veggies and chicken stock. I know it's better to make your own, but I just don't always have time for that. I usually use Kitchen Basics for my brand. Add your gravies now, as well. 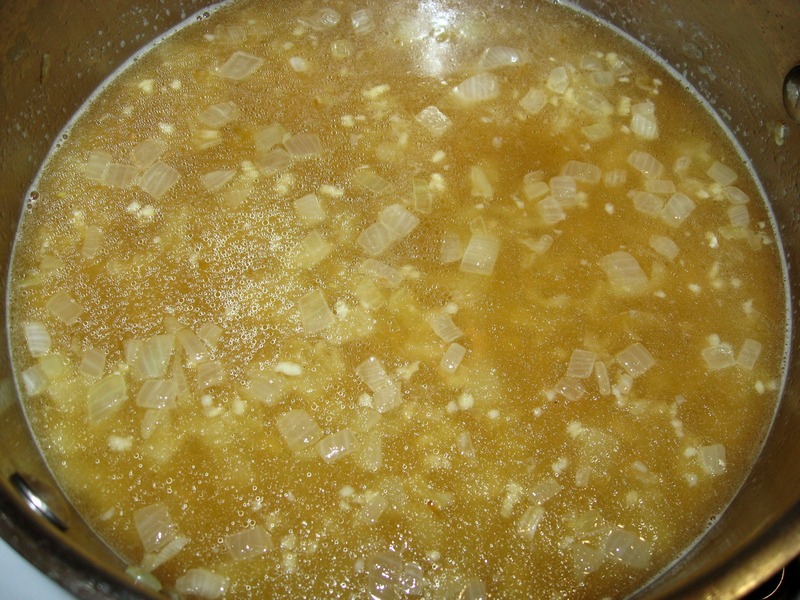 Mix it all well and pour into a very well-buttered (bottom and sides) crockpot. The gluten-free breads take much longer to cook. I usually put it on high for a couple of hours in the covered crockpot until it looks like it's cooking well, then switch to low for two or three hours. If it looks like it's not cooking through again, I switch it back to high. I also sometimes crack the lid open a little if it looks like it's retaining too much liquid. 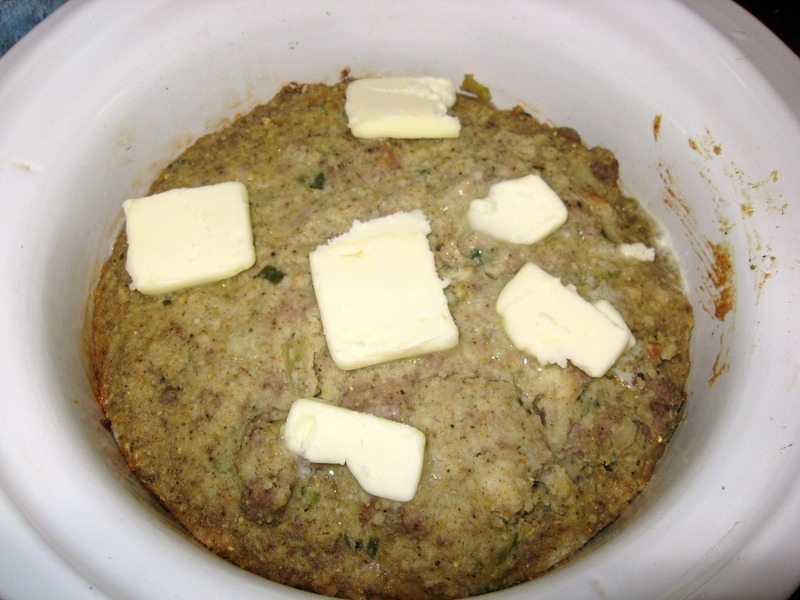 After it looks like it's cooked through, dot it with the butter and cover again, letting it melt and cook into the stuffing a little. Serve warm. 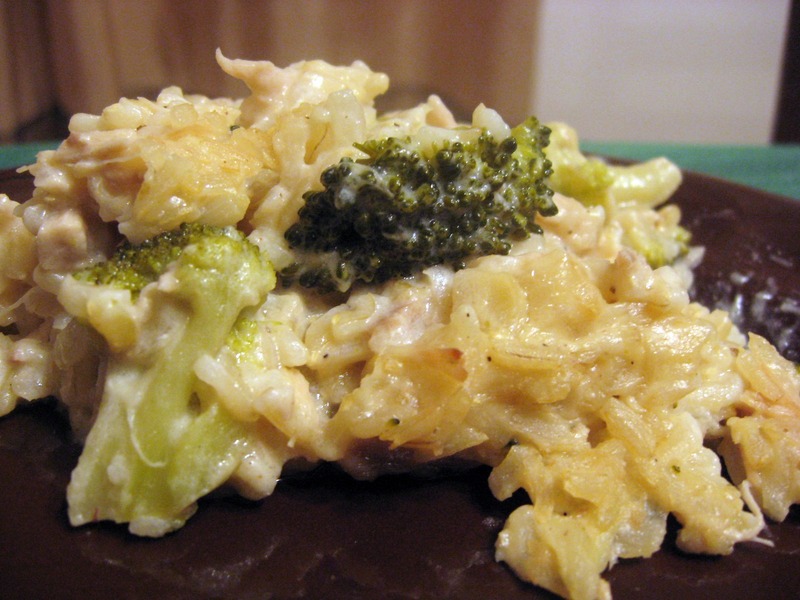 Store leftovers in the refrigerator or freezer. Yumm! Normally I would have this photo showing a slice with melted butter dripping from a slit halfway through the bread, but I was using the entire skillet of corn bread for my stuffing and needed it dry, so I didn't want to do that. Just sayin'. 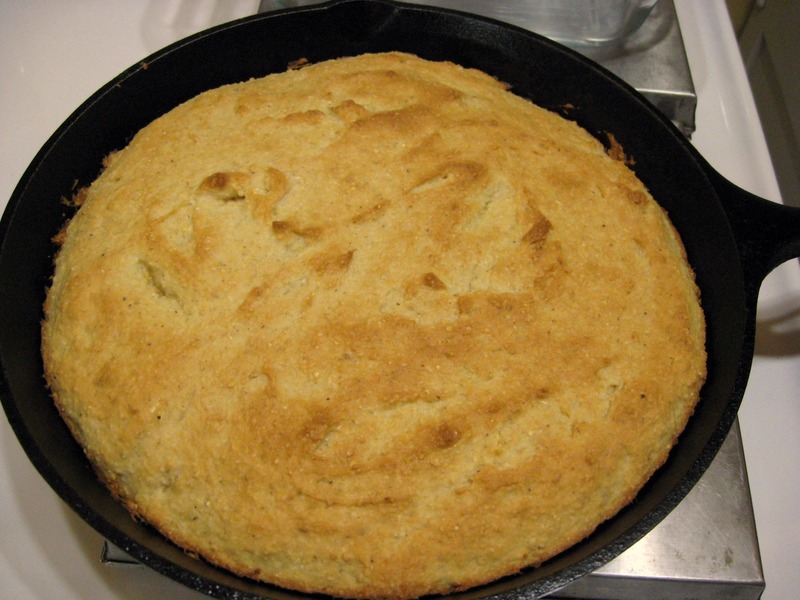 This cornbread, in my opinion, is perfect. The texture, weight, taste -- all of it. 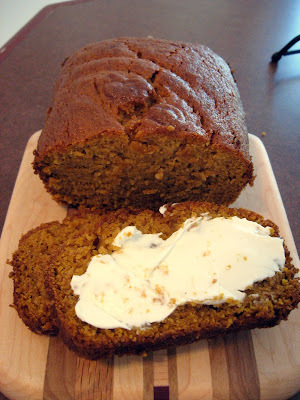 When I went gluten-free, I didn't know how I wanted to go about making my corn bread. 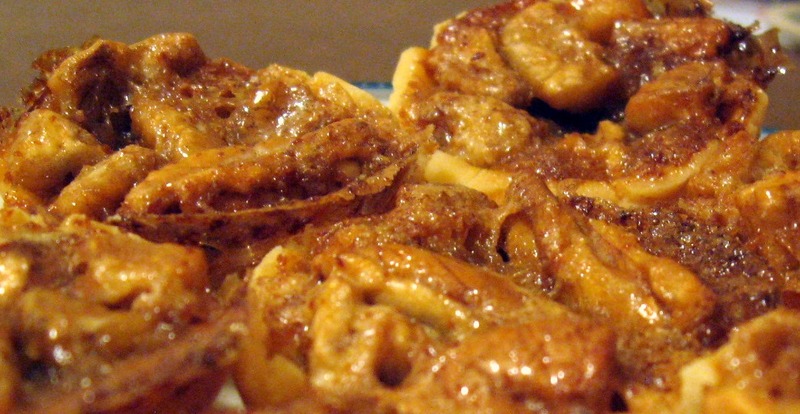 I had always used Aunt Jemima yellow cornmeal and had followed the recipe from the bag. Oh, what a treat I was in for when I started experimenting with different cornmeals and recipes! This is the one I've finally settled on. I've adapted it from Carol Fenster's Corn Bread recipe in Gluten-Free 101 . Projected prep time: 5-10 min; Projected bake time: 25-30 min. I use my cast-iron skillet for this recipe, but an 8-inch square or 9-inch round baking dish or pan would work. Preheat oven to 350 degrees. Melt butter and pour a little, maybe a tablespoon, into the skillet, coating the entire bottom and sides. Combine dry ingredients in a bowl and make a well in the center. Whisk eggs and milk together in another bowl until well blended. Add this mixture all at once into the well of the dry ingredients and mix just until starting to get moistened, then add the melted butter and mix well. Pour into skillet. 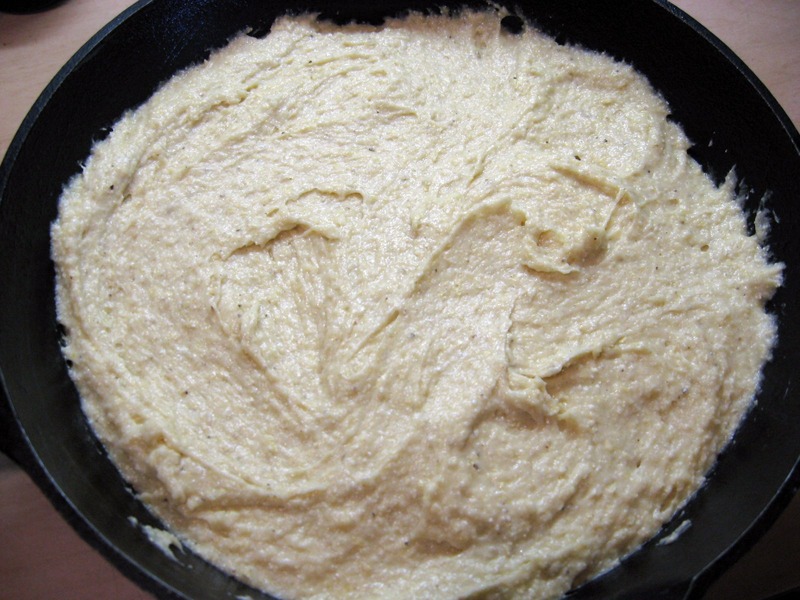 Bake 25 to 30 minutes or until the top is firm and edges are golden brown. Corn bread is done if a knife inserted in center comes out clean. Santa likes to put Gimbal's licorice Scottie dogs in our stockings. I love licorice -- both black and cherry. Thank you, Santa! Merry Christmas, everyone! 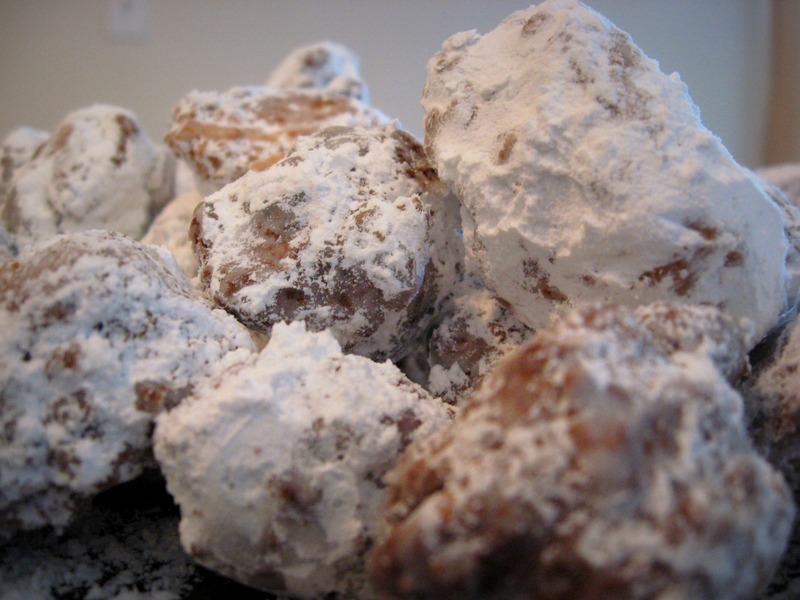 I thought for sure I'd have time to get at least one more recipe posted before Christmas, but it just didn't happen. I'll have some more next week. Now chili is on the stove and preparations for the big meal tomorrow are taken care of. We'll be attending our Christmas Eve service in a little while and then off to look at Christmas lights. Visions of sugarplums are dancing in my daughters' heads. I wish all of you a very merry and blessed Christmas! 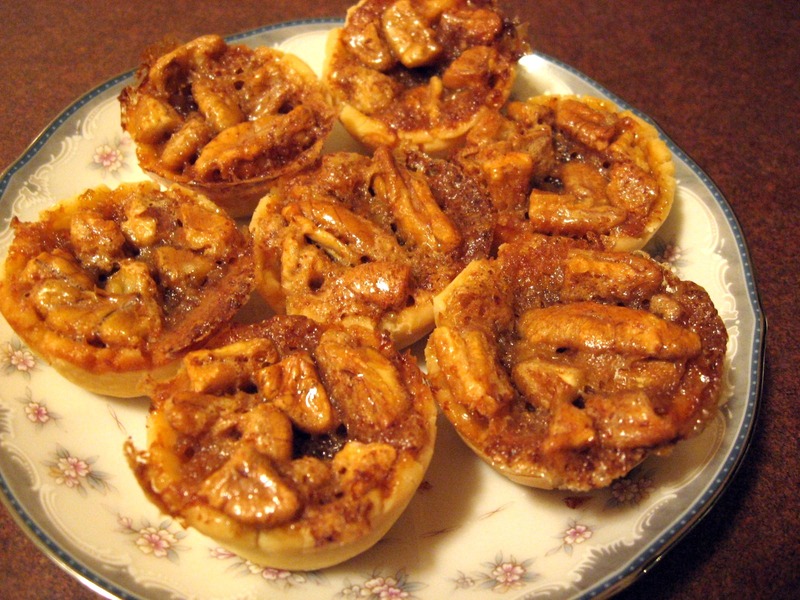 Pecan pie tarts, aka "pecan tarts" in my family, are a tradition on my dad's side of the family. My grandmother makes the best. When we went GF, that was one thing I wanted to make taste the same. It took a few tries on the crust, but I finally got a perfect tart crust. 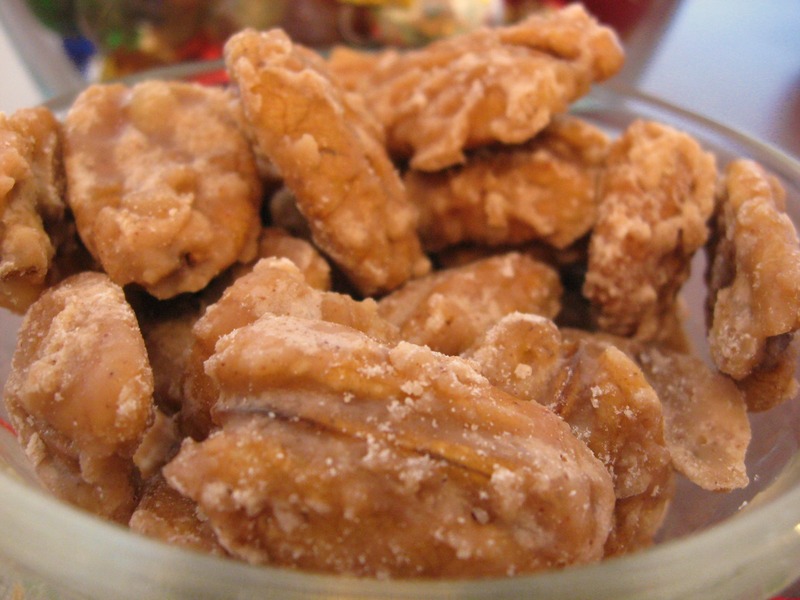 It has the perfect texture, taste and look for these delicious treasures. 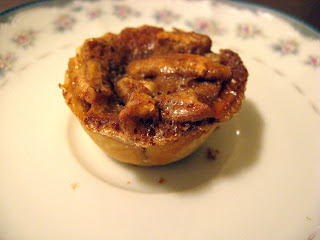 It would probably work well as a pie crust for the whole pecan pie, and maybe even other flavors, but I haven't tried that yet. I'll share with you that I was making these in a rush the other night. My kitchen was back in commission and we were leaving for the weekend. My first batch got medicated. Yes, you read it right. 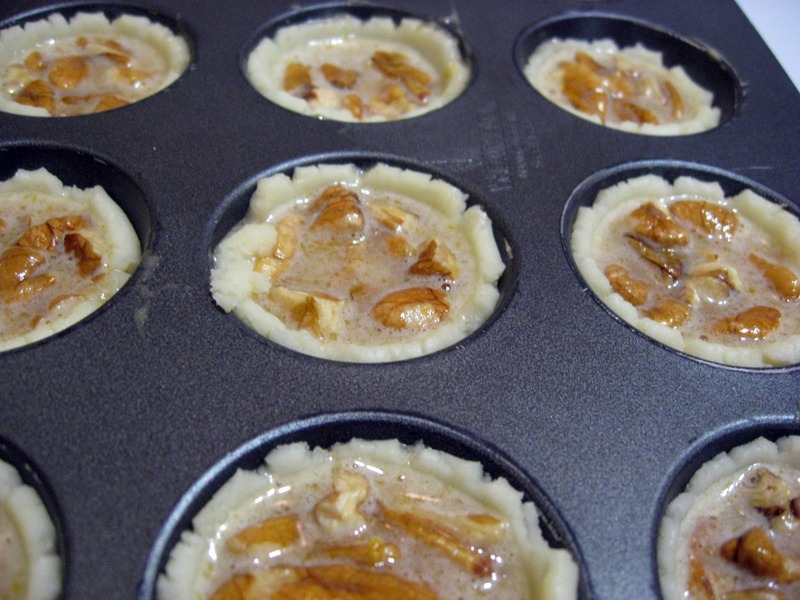 I was rushing to get them made before we went caroling and I started the filling (the crust was already chilled). I got the sudden feeling that I was coming down with something and so started whipping up my "immune booster" concoction. I ended up adding a dropper of Umcka into the filling bowl instead of my medicine cup. Oops. Thankfully I didn't have many ingredients in there yet, but what a waste of eggs and syrup! I didn't know how Umcka would flavor the filling once it was heated, so I started over, making the filling and sticking it in the fridge. I didn't get the tarts made until late that night, hence the lighting in these photos. And by the way, I thankfully didn't get sick. Either my concoction worked really well, and quickly at that, or it was exhaustion. Imagine that. Cream together cream cheese and margarine, then add pie crust mix. 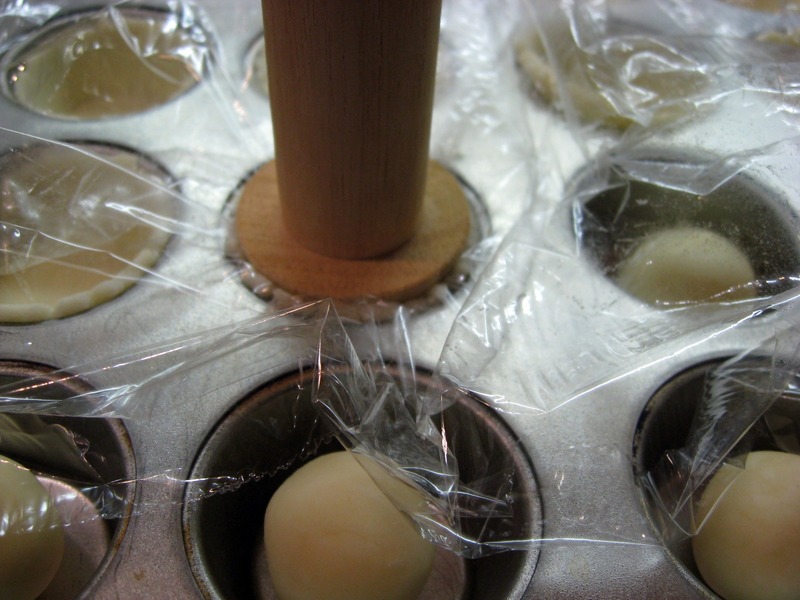 Mix very well and then form dough into a ball and wrap in plastic wrap. Chill one hour. 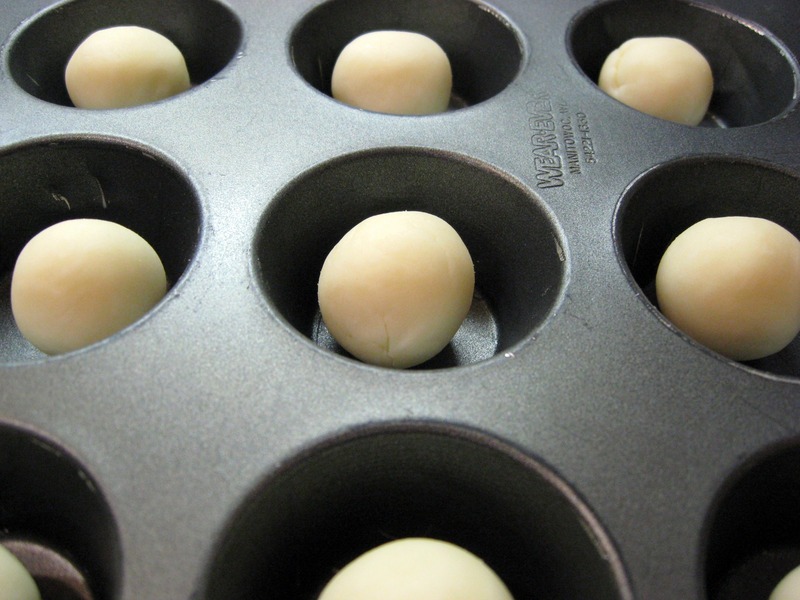 Shape into 1-inch balls and press into miniature muffin/cupcake pans. 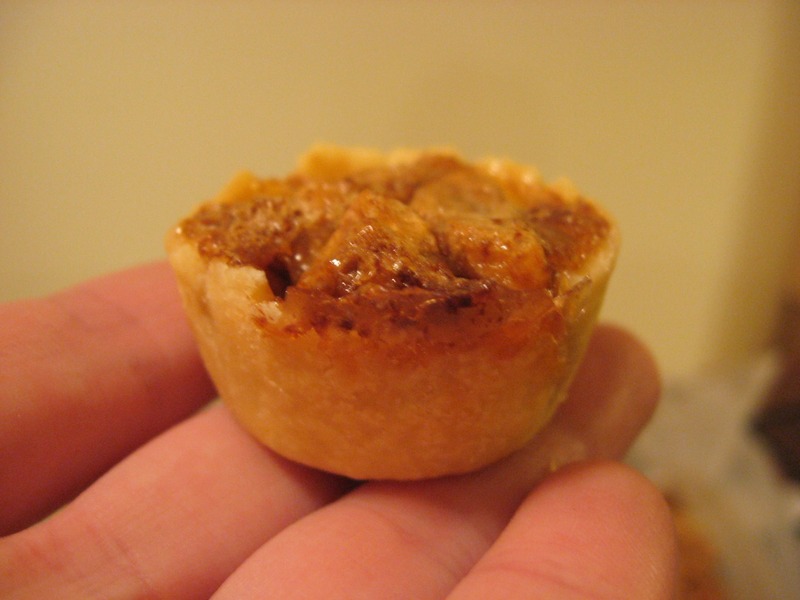 If you have a tart shell press it will make it much easier. Simply put the balls into the pan and then put plastic wrap over it, and push down on the press. Make sure you don't get the bottom too thin. 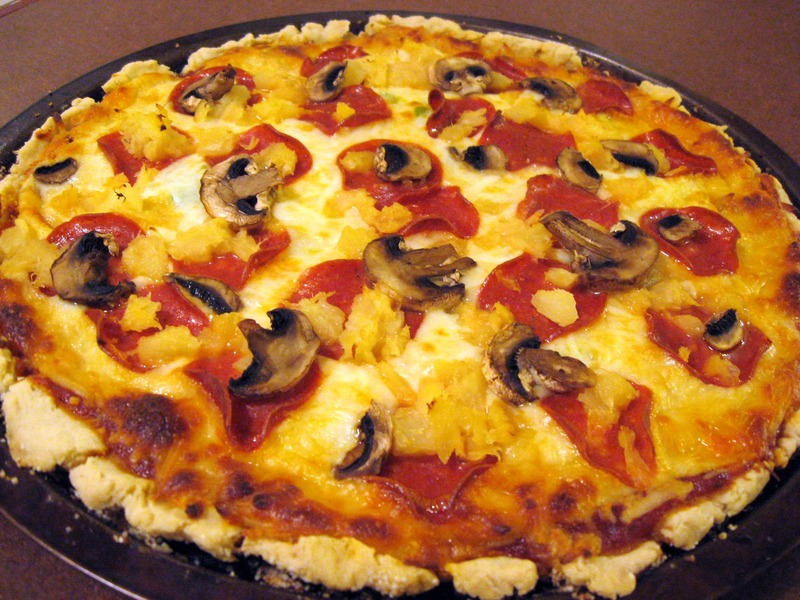 If it looks too thin, add a little more dough to the bottom. For the pecan filling, I follow the dark Karo recipe on the bottle, reducing the bake time and using pecan pieces instead of halves. It's the one my family has used for pecan pie for generations. I ignore my fears of GMOs and too much high fructose corn syrup (although Karo claims no HCFS, just the regular corn syrup, which is somewhat better, right????) when I use things like this. Some things are worth the occasional splurge. Dark Karo is one of them. Preheat oven to 350 degrees. After getting the tart shells pressed, add the pie filling. Bake on top rack if you have a gas oven, and bake for about 25 minutes. Check at 25 minutes. 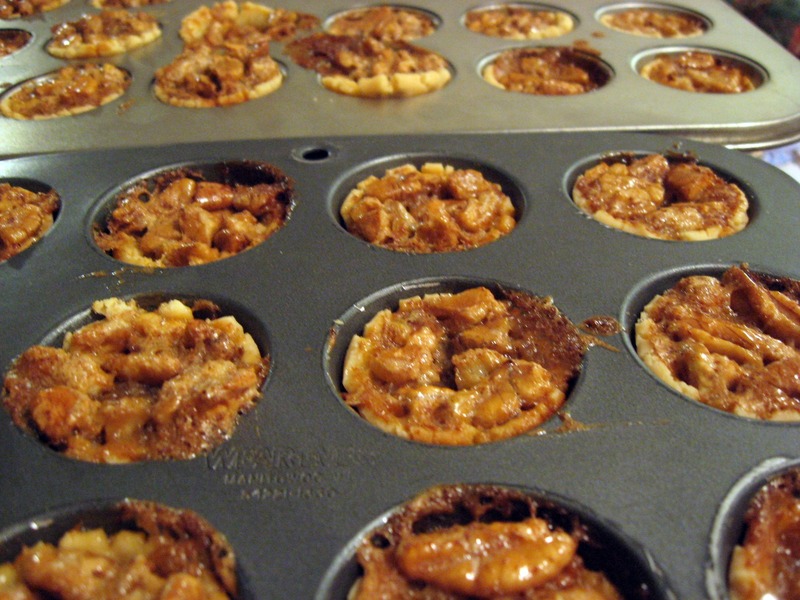 The filling temperature should be around 200 degrees. I use a meat thermometer, not my candy one, to check this. Cool in pans on wire racks and then store in single layers in airtight container lined with wax paper. If you won't be eating them all up within a day or two, you'll want to put them in the refrigerator. 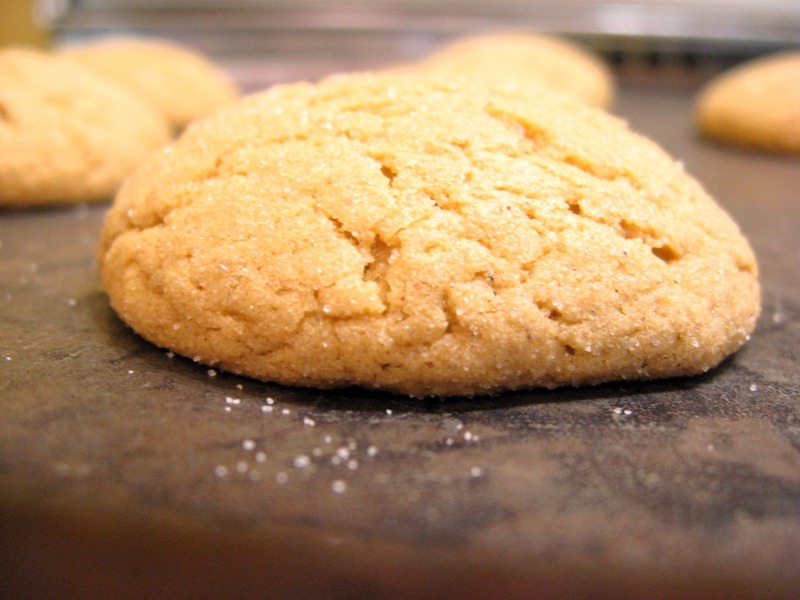 Don't throw away the crumbly cookies! Have hot water & range!